Hurry for this one! Rare 2 bed - 2 bath, Pet Friendly, first floor condo with both front and rear entries for easy access to everything. This is the spacious 'Brookside' with a great unobstructed view of large lake full of wild life. 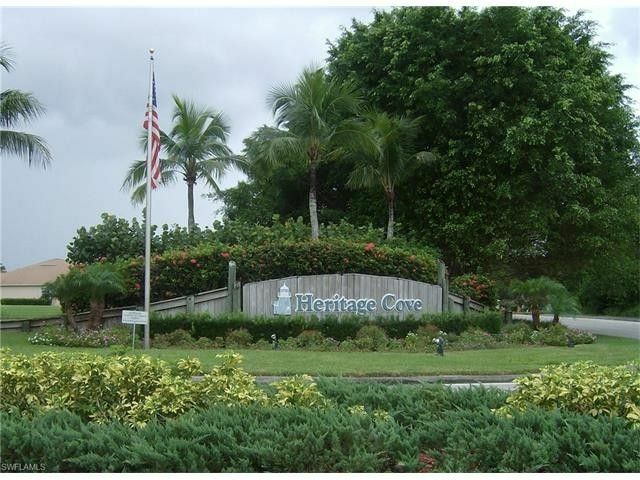 Heritage Cove is the area's most sought after 55 + community, great location, close to everything from shopping and restaurants to our white sandy beaches and wonderful waterways, all with easy access to the RSW airport. This is a very clean move-in ready Turnkey furnished unit with new AC, new Frig, Casa Blanca Fans, Tiled Lanai with screens and glass for extra AC room in the summer and to keep you warm in the winter. Extra storage across from unit door, covered parking and extra parking for guests. Amenities abound in this community with great landscaping and and wonderful social offerings: Bocce, shuffleboard, tennis, billiards, community pool, walking paths, on site management...and in the club house, a community room for bingo, dances, cards, parties and any other event you can think of. There is also a workout room, library, card rooms and a great kitchen for your convenience. Available for quick closing...your home for the upcoming season! Directions: From Cypress Lake go south on McGregor to First traffic light at A & W Bulb, turn left then left again into Heritage Cove. After passing through gate, turn right and follow to 4th building on the left...unit number shows as 413!